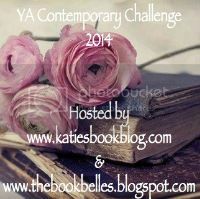 Boarding with Books: 2014 YA Contemporary Challenge! Losing Hope by Colleen Hoover - finished this one, it was great! Link to my review. The Truth About Alice by Jennifer Mathieu - Just recieved it from Netgalley and it sounds insane. Can't wait! Hopeless by Colleen Hoover!!!! This is the companion to Losing Hope and it's free today!!! Just downloaded it on Amazon. As for the rest, when I find them I'll add em! Any recommendations for me? Over at the host blogs there are all sorts of giveaways and fun stuff so head over and join in! I loved both Hopeless and Losing Hope! I actually just listened to the audiobook for Hopeless, and that was fantastic too.